Electric scooters are known to be a danger to riders and pedestrians. Many teens and young adults ride them on the sidewalks where they can hurt pedestrians. When e-scooters strike a car, the scooter offers no protection to the rider. There have been instances where the brakes and throttles have malfunctioned. Hitting a bump can cause the rider to fall. A new bill is aimed at making it easier for victims of e-scooter accidents in DC to recover damages for pain and suffering, medical expenses, and other damages due to injuries from these new modes of transportation. A bill was introduced by DC Ward 3 Councilmember Mary Cheh to include electric scooter injuries and electric bike injuries in the expanded contributory negligence law. In 2016, the Motor Vehicle Collision Recovery Act changed the standard for recovery where the plaintiff, the person injured, was partially at-fault for the accident and the plaintiff was a pedestrian or a bicyclist. Prior to 2016, Washington DC (unlike many states) held that if a plaintiff was just one percent at fault for an accident, they couldn’t recover any damages. The 2016 law changed the contributory negligence requirement. Now, a pedestrian or cyclist can recover damages as long as he or she is no more than 50% at fault for the collision. The 2016 law did not anticipate the enthusiasm for electric scooters. The bill proposed by Councilmember Cheh – Vulnerable User Collision Recovery Amendment Act of 2019 – would give non-rider victims of electric scooter accidents the right to use the 2016 law. 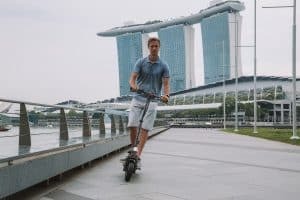 This means if a pedestrian was injured by someone riding an electric scooter and the pedestrian was less than 50% at fault or just 50% at fault, they could file a legal claim against the scooter operator. Councilmember Cheh asserted that the new law will allow victims of both bikes with a motor and bikes without a motor to benefit from the more generous contributory negligence law of 2016: “As the law stands today, the applicable negligence standard in a tortious accident for a cyclist may depend upon whether that cyclist was on a bike with an electric-assist motor or one without such a motor,” she said. As of late January, the bill was still in Committee. 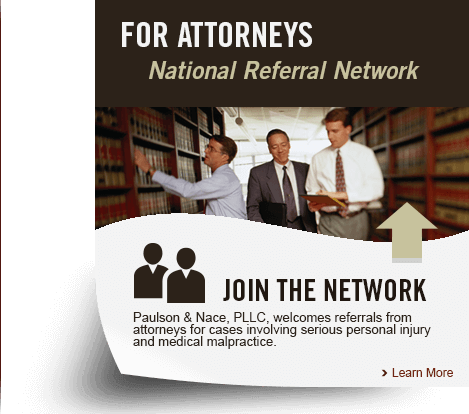 Please contact Paulson & Nace, PLLC through this contact form or by calling 202.930.0292.